When purchasing a print copy of Mixing It Slow, you will also receive a free ebook version.You do not need to purchase an ebook copy. After purchasing, you will receive a link to your e-book in your order confirmation email so please ensure you write your email address correctly. Some email providers will block my email however hence the need for an account. The link will also be displayed on your order confirmation screen. 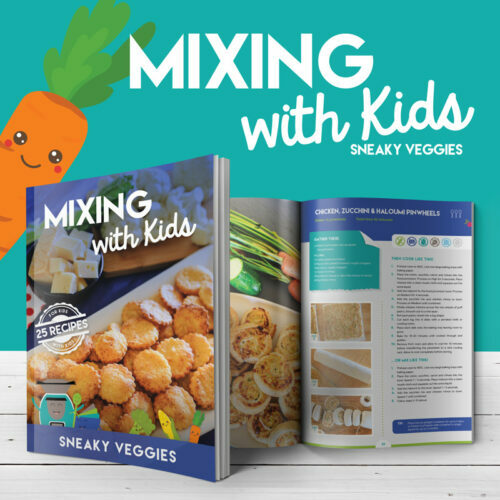 Last June I released the original Mixing It Slow cookbook – the very first cookbook out there to combine both your slow cooker and thermomixer to create easy, delicious and family friendly meals. With several print runs it was a well received and much loved book. Since then there has barely been a week where one of you hasn’t asked if I were to ever follow up with a second Mixing It Slow book. I am so excited to announce that Mixing It Slow Volume 2 is here! Like last year’s offerings Mixing It Slow Volume 2 brings with it a large range of delicious and easy to prepare family friendly meals that will warm your kitchens throughout Winter. We all know there is nothing quite like the tasty aromas floating through the house as the slow cooker simmers away. Want to know a little more about Mixing It Slow Volume 2? 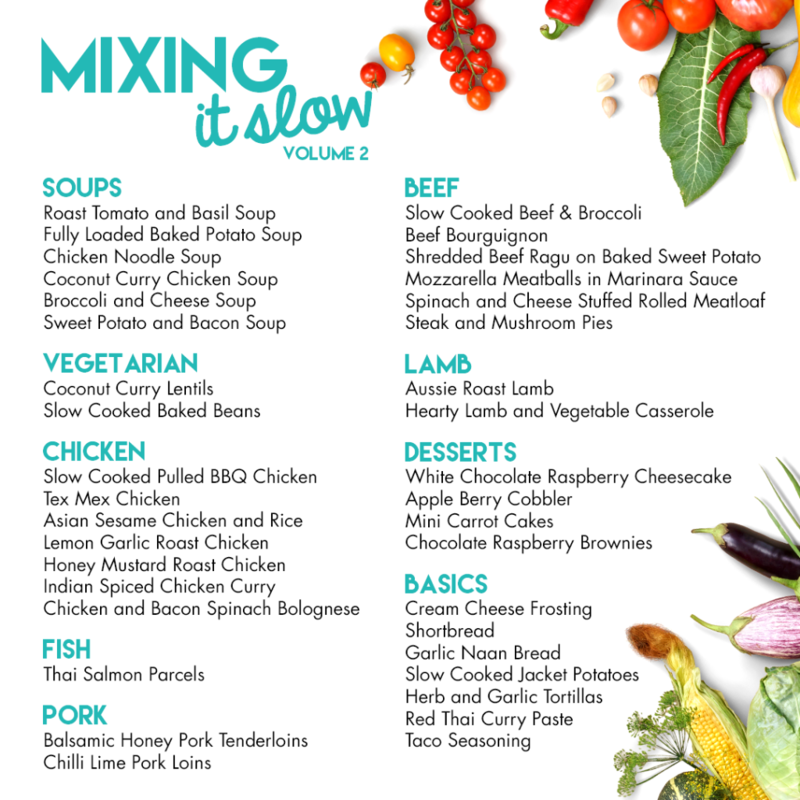 Mixing It Slow Volume 2 contains 37 scrumptious recipes that combine your thermo mixer and slow cooker. 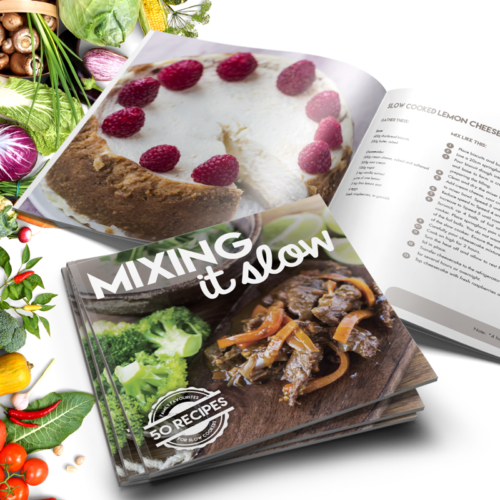 After feedback from last years Mixing It Slow cookbook, every single recipe (excluding basics section) is accompanied by a full page colour photo. These delicious looking photos have been shot by an amazing food photographer who knows thermomixers inside out. These photos will have your mouth watering! 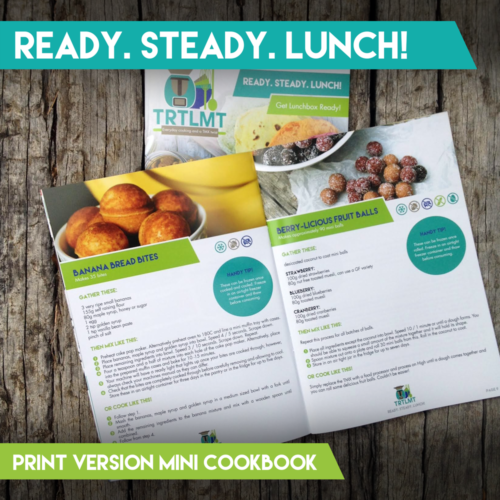 All recipes include serving size including whether a recipe can be doubled, total time needed to complete the recipe from start to finish and freezing info. Included in the back of the book is a handy “Common Questions” section to help you get the most out of your slow cooker. Mixing It Slow Volume 2 is the same size as the original so they will sit nicely together on your bookshelf. 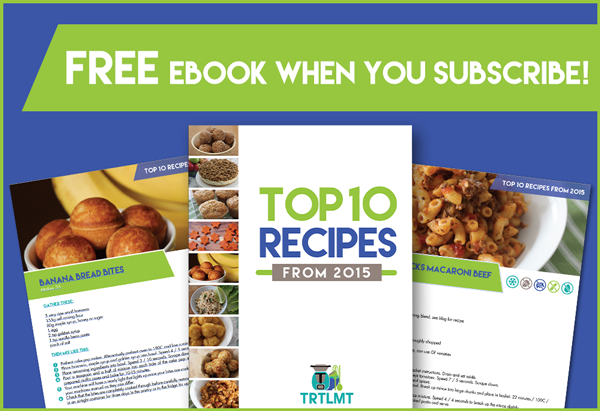 Most recipes can be adapted to suit allergies and intolerances. If you do not have a slow cooker you can replace the slow cooker with a casserole dish and an oven and cook low and slow. Oven instructions are not included however. Want a sneak peek of the recipes before you buy? From soups to chicken to beef to desserts, we have you covered. What recipe would you like to try first? Price is in Australian dollars and is inclusive of GST and includes FREE postage. After purchasing a print copy of Mixing It Slow Volume 2, you will receive a link to your eBook in your order confirmation email. It is extremely important that you write your email address correctly in the order details box so the email reaches you. It will also be displayed on your order confirmation screen. We highly recommend saving that link immediately. Available to Australian and New Zealand residents only. If you reside outside of these countries and wish to purchase please contact me. Postage will be additional. Orders are posted within 3 business days unless otherwise indicated. Orders will be sent to the address listed on your website order. Please ensure this is correct. If ordering multiple books for family and friends, they will be sent to the address on the order, not to several different addresses. Unfortunately no notes can be left for Australia Post as to where this your parcel will be left. Your order will be sent via regular post with Australia Post. Registered post can be purchased in your order at an additional cost of $4AUD (Australia Post current charge as of July 2017). No responsibility will be taken by TRTLMT for lost packages. Purchasing registered post is recommended. 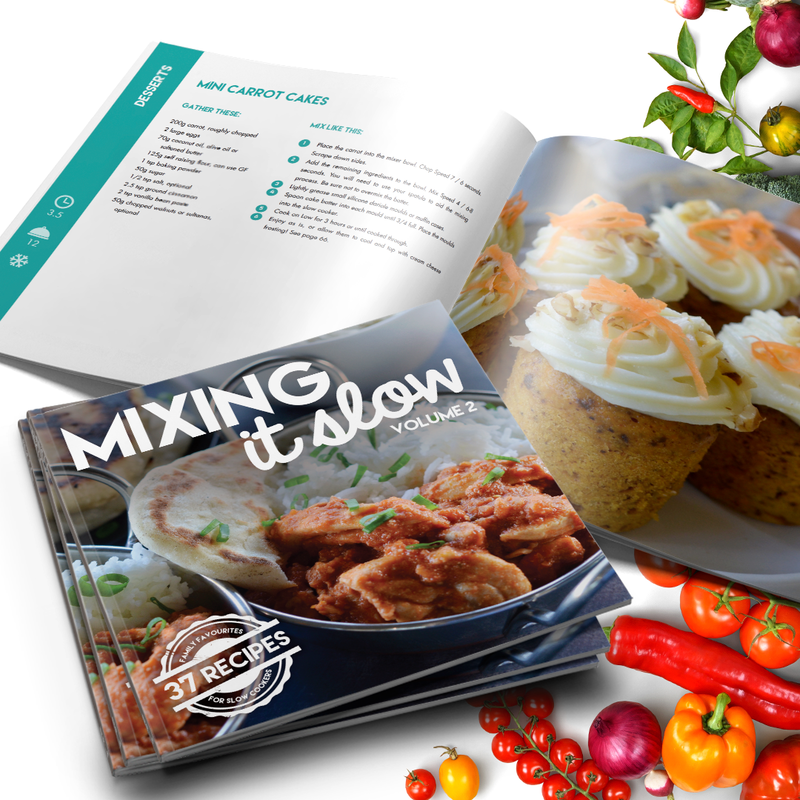 New recipes within Mixing It Slow Volume 2 may appear in future publications or the website.